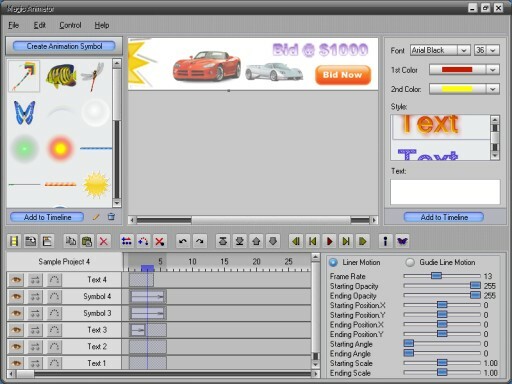 Magic Animator is a quick and powerful tool for making cool GIF animations, impressive banners and animated videos. Magic Animator helps you express ideas and concepts, make your website or presentation more attractive and fun. Once finished, output can be exported as GIF, SWF and AVI clips. Create and design GIF animations, bannder ads and animated videos. ...... To prepare your animation project, you can create animation symbols with its animation symbol creation tool and save them to symbol library. In addition to font size and color, you can apply special text styles like drop shadows, blur, glows or emboss. Magic Animator also provides lots of high quality animation symbols to help you express ideas and concepts, make your website or presentation more attractive and fun. Once finished, output can be exported as GIF, SWF and AVI clips. MagicTweak can help you to Optimize and personalize Microsoft Windows. MagicTweak is a special software designed to optimize Windows XP/2000/Me/9X . Qweas is providing links to Magic Animator V1.4.2 as a courtesy, and makes no representations regarding Magic Animator or any other applications or any information related thereto. Any questions, complaints or claims regarding this application Magic Animator V1.4.2 must be directed to the appropriate software vendor. You may click the publisher link of Magic Animator on the top of this page to get more details about the vendor.